Las Piñas was once a fishing barrio of Parañaque. In 1762, upon the request of the Augustinians, the barrio was recognized as a town with 1,200 residents, mostly involved in farming, fishing, and salt-making. However, Las Piñas was unable to sustain its own parish and still remained under the watch of the parish priest of Parañaque, Fr. Gregorio Giner. It was in August 1775 when the spiritual administrationof the town was turned over to the Agustinian Recollects, with Fr. Nazario de Ayala as its first parish priest. They were not to receive any support from the government unless they meet the minimum requirement of having 500 tax-paying residents. At that time, there were only 300 taxpayers in Las Piñas. Two decades after the Augustinians took over the parish, Fr. Diego Cera was appointed parish priest. Upon his arrival in Las Piñas, all that Fr. Cera saw was a small chapel made of bamboo and nipa. Together with the residents, he dreamed of a church made of stone. In 1800, the building of the stone edifice began, with townspeople rendering construction services in exchange for food. The church, in what is described as “earthquake Baroque” architecture, was completed in 1819. It had three naves, a dome, side altars, crypt sones each with a replica of the “Nuestra Señora dela Consolacion” on one side and St. Augustine on the other, a baptistry with a stone altar, and two sacristies. The church underwent a major restoration, which was completed in December 1972, under the care of Architect Bobby Mañosa. While the stone church was still under construction, Fr. Diego Cera prepared to build a pipe organ that would fill the church with religious music. In 1816, he gathered bamboo poles and burden these under the beach sand. Bamboo was abundant in the area and burying the poles was a natural way of protecting it from attacks of pests as well as for preservation. After a year, he unearthed the bamboo poles, and with the help of some residents whom he had earlier trained, Fr. Cera began building the organ. Musicologist Helen Samson writes in her book The Bamboo Organ of Las Piñas that Fr. Cera at first attempted to use bamboo for one hundred and twenty two trumpet pipes. This experiment proved unsatisfactory so the bamboo trumpets were replaced later by pieces made of metal. The initial bamboo trumpets came to be relegated as “blind” or purely ornamental pipes and placed at the rear. The bamboo organ is composed of 832 bamboo tubes and 122 horizontally placed metal pipes. It has 23 stops and measures 5.17 meters tall, 4.11 meters wide, with a depth of 1.45 meters. Wind pressure for the bamboo organ is supplied by the billows, which, during Fr. Cera’s time, required the steady cooperation of six persons working in shifts each time the organ is played. A steady wind supply is necessary for the proper maintenance of pitch – too little pressure would cause the pitch to go down, while too much would make the pitch higher. Unfortunately, three earthquakes in July 1880 wrought major damage to the bamboo organ. And a devastating typhoon in October 1882 totally wrecked it, with many of its parts taken adrift in the floodwaters. Initial effort to restore the organ came in 1960 when the German government offered to cover the cost of restoration, provided it was done in Germany. Various concerns, including the safe transport of the organ parts, put the restoration project on hold. A decade later, the parish priest, Fr. Mark Lesage, C.IC.M. and his assistant, Fr. Leo Renier who was an organist, led the move to restore the bamboo organ. In 1973, two technicians from the Klais firm, arrived in Las Piñas to dismantle the bamboo organ. On February 18, 1975, the Las Piñas Bamboo Organ was brought back to life and a celebration ensued with a concert at the Philippine Embassy in Bonn with eminent organist Wolfang Oehms. 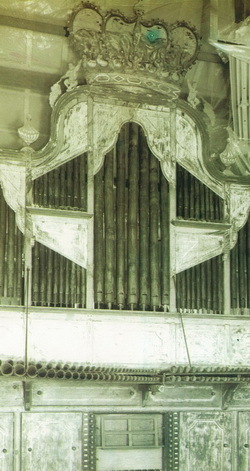 The organ made its homecoming on March 13, 1975. To celebrate the return of the Bamboo Organ to its home, an inaugural concert was held featuring Wolfang Oehms, Lucrecia Kasilag (who was eventually named National Artist), the Las Piñas Boys’ Choir, Maharlika Rondalla, and the Cutlural Center of the Philippines Orchestra. Since then, an annual International Bamboo Organ Festival has been held every third week of February, attracting musicians and music enthusiasts from all over the Philippines and the world. The Festival is now on its 36th year, and Villar SIPAG has been a sustaining patron. Villar SIPAG hosts a Filipino-themed cocktail after the gala performances. Samson, Helen. The Bamboo Organ of Las Piñas. Las Piñas City: The Bamboo Organ Foundation, 2006.